I read many books, often two or three at a time, from publishers, friends, and writers who've found my reviews on Amazon.com. I turn down more requests than I accept. When Julie Maria Peace, the author of A Song in the Night, contacted me, I knew I had to read and review her book. Not because it sounded interesting and not because I had time to read a large novel. What caught my attention was the fact that she lived in England and had visited Georgetown, Texas, where I live. She sent a photo of herself on the town square here to prove it. That was not the best reason for accepting a book for review, but I am glad I did. It turned out to be one of the better books I've read in a quite some time. I plan to tell everyone I know about this book in hopes they will all read it. 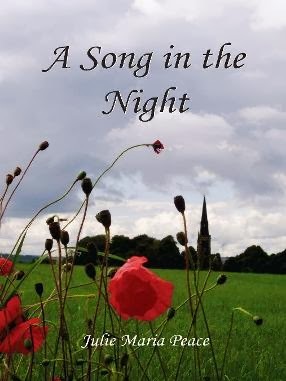 A Song in the Night consists of two stories running parallel, one set during World War I and the other in contemporary time. Each would have made an enjoyable book alone, but the way the two are weaved together is magic. Here's how the stories are tied together. Beth Maconochie, in the contemporary story, finds a diary written by a British soldier named Sam. She is captivated by his story, but finds the handwriting difficult to read. She asks her sister-in-law Rosie to transcribe it. In this way they both read the diary. The author's technique for presenting the diary is to begin each segment with the format of a diary and then switch to a narrative style. This makes it easier to read and provides more insights into the war. There is much more going on in Beth and Rosie's part of the story, than reading the diary. Beth and her husband, both musicians are experiencing life-changing complications in their lives. Rosie is struggling with conflicts from her past as well the present. She is forced to change in ways she hadn't known possible and finds the change painful at times. All along the way, the reader sees that Sam and Rosie are facing similar situations. I can't tell you more for fear of spoiling it for you. But I can say this is one of those books you won't want to miss. It fits into the Christian fiction category, but I believe it would an enjoyable experience for all, regardless of religious affiliation. Enter the drawing for a free copy of A Song in the Night.